The second week of June, my mother and I went to Michigan to clean out my grandmother's house in preparation to sell it. Not to worry; my grandmother is still alive, but can no longer live on her own without around-the-clock care. Her dementia is getting worse every day and living alone, 13 hours away just wasn't working for our family any longer. In April, my mother and I moved my grandmother into an assisted living facility here in Georgia, closer to both of us. In fact, the facility is just 2.4 miles from where I work! It's a wonderful place but costs more money than my grandmother makes each month, so selling the house is important. As we cleaned, we divided up her belongings between my mother, my aunt, and me. 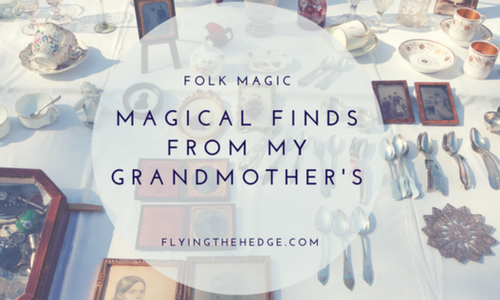 I have to say, I didn't realize how much JUNK was in the house until we started going through everything, but I did find some really amazing trinkets and a whole lot of folk magic infused into everything my grandmother did. When my grandmother was young, she converted to Lutheran, thus my mom and aunt and later me were all raised Lutheran. No one in my family is particularly religious, and obviously, I didn't remain a Christian, but I do recall it used to mean something to my grandmother. That's why when I began to find magical items around the house I was taken aback. In fact, my mother had to explain certain things my grandmother did because I had never seen or heard of some of the folk magic my grandmother clearly practiced despite her faith. My mom and I went through an entire house that my grandmother had lived in for 60 years in just a couple of days. It was a lot of work, but interesting and fun all the same. 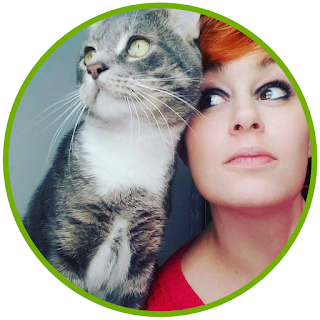 I brought home some sentimental items I wanted to remember my grandmother by and a number of powerful magical items I found in her belongings. I wanted to share some of these amazing finds and a bit of the folk magic I found in my grandmother's house. The first item I knew I had to have was a small silver box my grandmother kept potpourri in. This item was on a bookshelf in her living room and despite its inoquous nature, the moment I picked it up, I knew it was special. 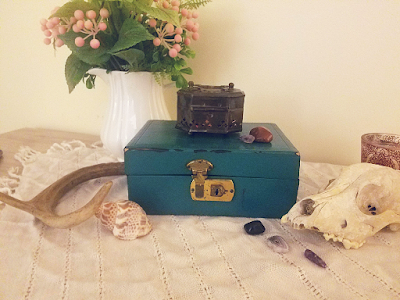 I plan to use it, along with a small jewelry box I found, as a charging box for some of my magical supplies, especially my crystals. Speaking of the small jewelry box, my mother found it tucked away in a closet filled with sewing supplies. There is nothing particularly magical about the box, but I knew I could put it to good use. 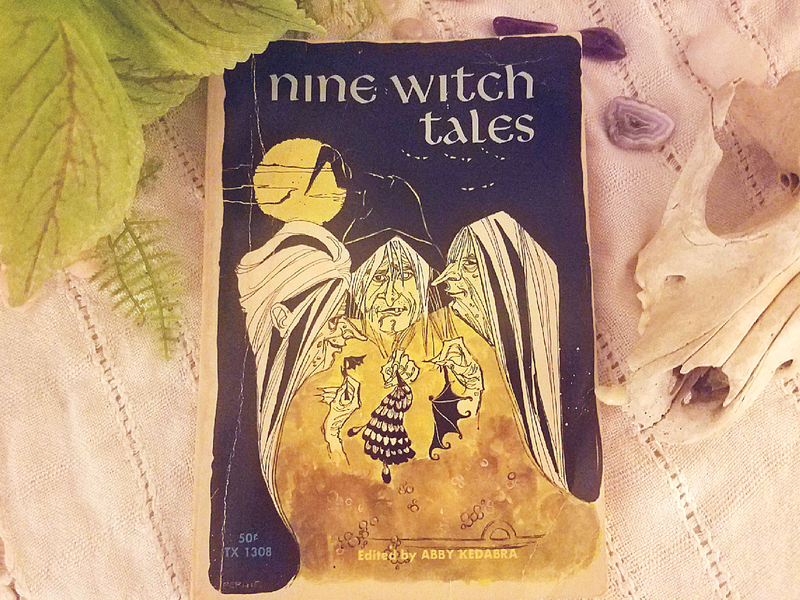 Also on the bookshelf was a delightful little book called Nine Witch Tales. The book is from 1968 and is full of folklore stories regarding witches. From what I have read thus far, most of the tales are retellings of fairy folklore from W.Y. Evans-Wentz's book The Fairy-Faith in Celtic Countries. I am always amazed at how much his 500-page manuscript influenced modern fairytales and witchcraft. The next item I threw in my slowly growing collection to bring home was a jar full of sweetgum seed pods, affectionately referred to as Witch Burrs. My mom is convinced my grandmother collected them in Georgia and placed them on a shelf above her kitchen table, but I am not so certain. Either way, when I first picked up the jar I laughed and sat it with the rest of the jars we were putting in the yard sale. As I took more items off the shelf, something kept tugging at me, pulling my attention back to the jar. I finally stopped what I was doing, picked up the jar, and listened. It was vibrating with very intense magic. I don't know if you can tell from the picture, but whatever my grandmother did, it works. I know, wherever she picked up the seed pods, she did so with love and fond memories. 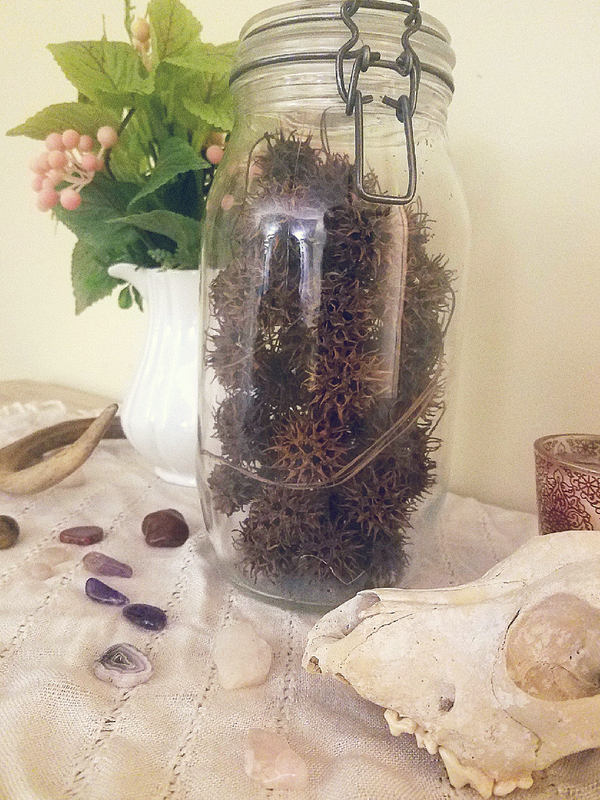 This jar may be the most magical item I brought home with me. I'm not really sure what I am going to do with it, but I know it wanted me to bring it home. It called loudly, and I listened. As we were clearing out rooms and closets, my mom and I found a number of crystals and stones all over the place. Some were sitting on random shelves, others were tucked into drawers, in boxes, or on windowsills. Its obvious from the collection I came home with my grandmother preferred amethyst and tiger's eye, which isn't surprising if you know her. Amethyst is a calming stone while tiger's eye gives courage and strength; these are traits my grandmother has always needed, especially after my grandfather died when my mom was a teenager. My grandmother has spent 30+ years alone; she never remarried or dated after my grandfather died. I don't want to get into her entire life history, but between my grandfather's excessive drinking and his early death, peace and strength were the two things she needed most. Apart from amethyst and tiger's eye, she also had a number of agates and carnelians. Carnelian is also representative of strength, again something she needed. The last item I am happy to share with you guys was a horseshoe. This is probably one of the most well-known forms of folk magic around. Horseshoes are a symbol of luck and protection. When hung in the home, they prevent negative entities and energy from entering the house, thus protecting those inside. Furthermore, horseshoes are a symbol of luck, bringing their owner good fortune. I mentioned that despite my grandmother being Lutheran, she practiced folk magic, whether she realized it or not. The horseshoe, for example, was hung above a door frame in the basement to prevent negativity and bring the owner good luck. On window sills, my grandmother placed a number of crystals, probably because she liked them, but many of the ones I found on the sills are also protective stones, such as carnelian and iron ore. Above a window is where I found the jar of Witch Burrs, another protection symbol used to ward off evil and negativity. One of the most curious pieces of folk magic I discovered was pennies left in empty purses. As I was cleaning them out to put out in the garage sale, I kept finding a penny in EVERY SINGLE empty purse my grandmother owned. When I asked my mom about the pennies, she told me it was good luck to leave a penny in a purse, that carrying it meant that you should also be prosperous and your "purse" never empty. To empty the purses of the pennies was bad luck, which could be transferred to the next owner. This was completely new to me. I made sure I put the pennies back and apologized for their removal. Overall, I ended up with some fantastic little trinkets and learned a lot about my grandmother and my family tree. Thankfully my grandmother kept everything, especially sentimental items, which means my mom and I found tons of records, pictures, and letters from family members long since passed. I'll be sad to see my mom's childhood home sell and be removed from the family; it is especially hard on my mother who has a pair of handprints in the garage floor from when they laid the original foundation and memories in every inch of the house. I know, however, that the home is aching for the sound of children again and desperately wishes to be loved and cared for like it was before my grandmother could no longer keep up with it. I know it will go to the right people, who will make the house whole again.